As a result, the data set is staggering in size, but positive in message: as a species, we have ‘greened’ an area equivalent to that of all the Amazon rainforests, at a rate of more than two million square miles of extra green leaf area per year (or a roughly five percent increase compared to the early 2000s). And the unexpected source for much of this new greenery? China and India. In the late 80s, both global powerhouses noticed that soil and air quality was decreasing, and they would need to do something drastic to sustain their ever-growing populations. 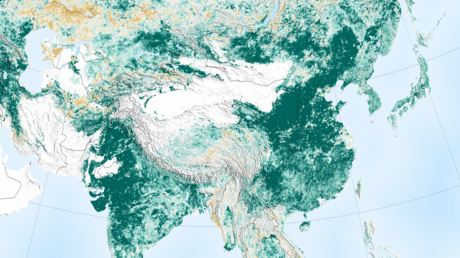 China began highly ambitious tree planting programs, and both countries launched intensive agriculture programs. According to the study, 42 percent of China’s greening was due to conservation and reforestation efforts aimed at curbing soil erosion, air pollution and climate change. An additional 32 percent (and 82 percent in India) was due to cultivation of food crops to feed their massive, and rising, population. The greening saw qualitative increases as well, as Chinese production of grains, vegetables, fruits has increased by about 35-40 percent since 2000. “But, now that we know direct human influence is a key driver of the greening Earth, we need to factor this into our climate models,” Rama Nemani, a research scientist at NASA’s Ames Research Center, in California’s Silicon Valley, and a co-author of the new work said. The team were quick to point out that it’s not all good news: while the surprising results make for a welcome update, they do not offset the damage from loss of natural vegetation in tropical regions, such as Brazil and Indonesia, most notably in terms of biodiversity and irrevocable species loss. The teams findings were published in the journal Nature Sustainability on February 11.